Looking for something new to incorporate as a staple side dish? 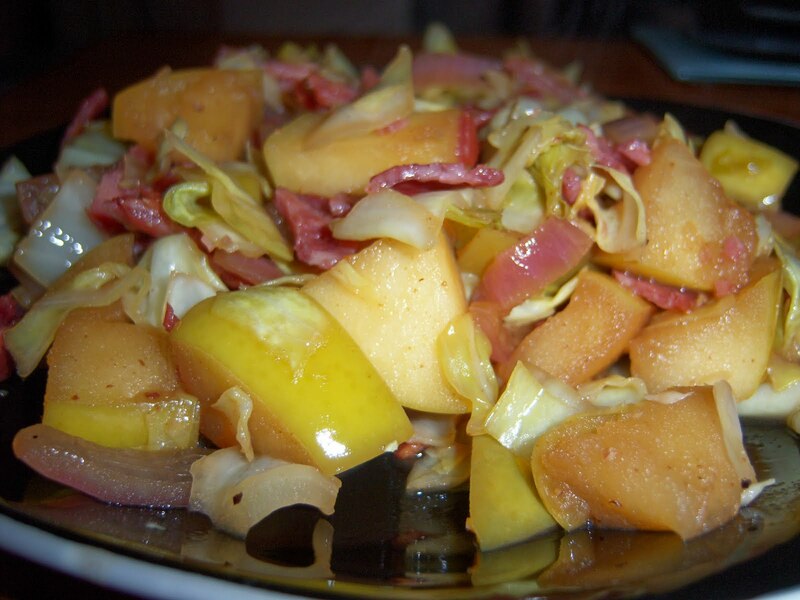 Try this tart and sweet mixture of cabbage, onion and apple with smoky undertones of turkey bacon. You can’t go wrong with this Irish inspired dish! 1. Preheat skillet over Medium heat. Add a dab of coconut oil to pan. Place uncured turkey bacon in skillet, flipping occasionally, until it is browned and most of the fat has cooked off. Remove from skillet and place on cutting board, chop into bits and return to skillet. 2. Add onion and apple and stir to coat in turkey bacon fat. Season with sea salt and fresh black pepper to taste. Cook until onion begins to caramelize. 3. Add cabbage, stir to coat it in bacon fat and cook until cabbage begins to wilt, about 4 minutes. Stir in optional stevia at this time. 4. Deglaze the pan by adding cider vinegar and scraping the pan with a wooden spoon to incorporate the browned bits into the sauce. Add chicken broth and season with a few pinches of sea salt and more freshly ground pepper. Bring mixture to a simmer, then reduce heat to Medium-Low and cover the pan tightly. Simmer cabbage, stirring occasionally, until it is soft and soupy and turkey bacon is tender, about 25 minutes. If cabbage begins to look dry, add more chicken broth or water.